Although Europe’s great powers had not engaged one another in land-based conflict since 1871, Great Britain’s standing armed forces in 1913 numbered 522,000 men (more than 5 times higher than our current levels in 2014, by way of comparison). At the outbreak of war on August 4th 1914, however, none of these troops were stationed in Continental Europe and were largely spread out across the Empire. In terms of combat-readiness, only 6 infantry divisions and a single cavalry division – less than 90,000 soldiers – comprised the UK-based British Expeditionary Force. At a Cabinet meeting on August 6th, newly-appointed Secretary of War Lord Kitchener insisted that 2 of these divisions remained in Britain to provide home defence. Accordingly, Sir John French and 50,000 troops were ordered to France, to confront the German First Army which had been instructed by the Kaiser to “exterminate the treacherous England, walk over General French’s contemptibly small Army“. It is estimated that more than three million Austro-Hungarians, and four-and-a-half million Germans were available to their nations and under arms. The following day, Lord Kitchener issued his now famous public call for 100,000 volunteers to form the ‘New Armies’ and fight in France alongside the Regulars and the now-activated Special Reserve & Territorial Battalions. A number of Saracens players were to swiftly respond to the nation’s call in August 1914, including Walter Black, Sydney Sylvester, Alfred Ball Reginald Potts, Victor Barnett and others; we shall follow their individual experiences and progress into uniform elsewhere in this project. They were to be part of a patriotic surge that was quite unprecedented and has been called “perhaps the last true expression of the philanthropic society to be seen in modern Britain“. Recruitment to the regular army had been a significant challenge in the past years. 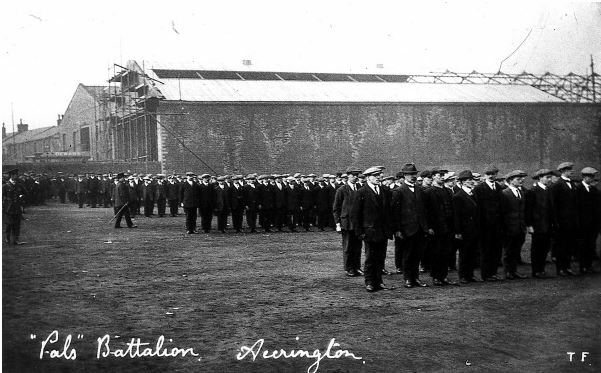 In 1907, the War Office had set a target of 37,710 recruits per year in order to maintain the standing army’s requirements. In 1912 only 30,313 men signed up. This number fell again to 27,999 in 1913. The scepticism expressed by certain staff officers regarding Kitchener’s 100,000 target was understandable in this context, and the situation was further compounded by the fact that many of the recruiting officers in the system were, themselves, part of the Territorial or Special Reserve forces being called up for active service. Despite the pressures on a creaking recruitment system designed to deal nationally with fewer than 100 recruits per day, the scepticism was unfounded. 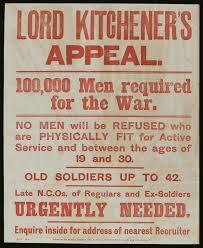 More than 64,000 volunteers responded to Kitchener’s call in a matter of days; by the end of August, this number had swollen to 298,923 enlistments, a number which was to be substantially exceeded in September. On August 9th in London alone, 9 new recruitment offices were opened. Across the country, local Lord Mayors threw open their Town Halls and committed the services of their administration staff in order to circumvent any of the traditional Army Recruitment office bureaucracy and red tape that appeared to be a barrier to enrolling volunteers into the New Army. 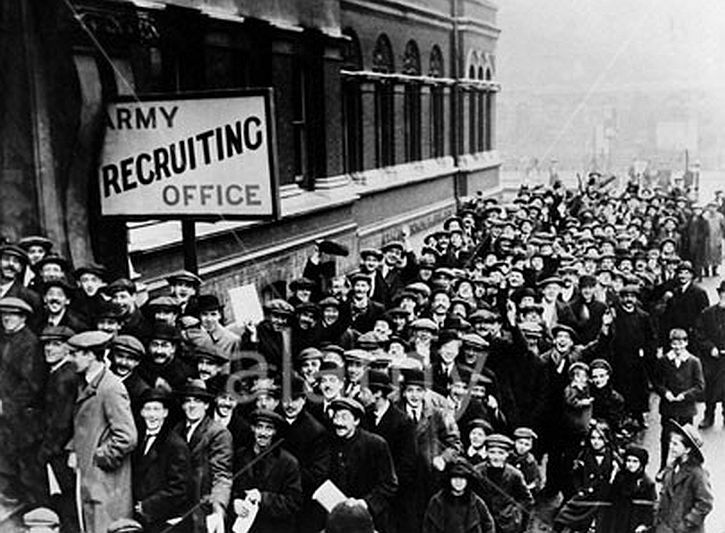 This mass movement to enroll was stimulated and encouraged by a War Office letter circulated in August, asking that “gentlemen of local influence and knowledge” might be identified to tour their regions “with the object of inducing young men to enter one or other of the various forces now in need of recruits“. This initiative was, in one swift move, to enable the sweeping away of decades of army recruitment habits which had traditionally seen working-class regulars signing up for a salaried army career, where they would be led by officers from privileged backgrounds & the nation’s public schools. Out of nearly 1,000 Battalions raised from volunteers during the First World War, almost two-thirds were to be locally-raised “Pals’ Battalions”. These were epitomised in Lord Derby’s famous speech as he encouraged young men to join up in his own regional sphere of influence, Liverpool: “This should be a battalion of pals, a battalion in which friends from the same office will fight shoulder to shoulder for the honour of Britain and the credit of Liverpool”. Nevertheless, the nation rallied to Kitchener’s call, the Pals Battalions formed across the country, and our Saracens players from the pre-1914 era flocked to the the colours along with their friends, colleagues and workmates.